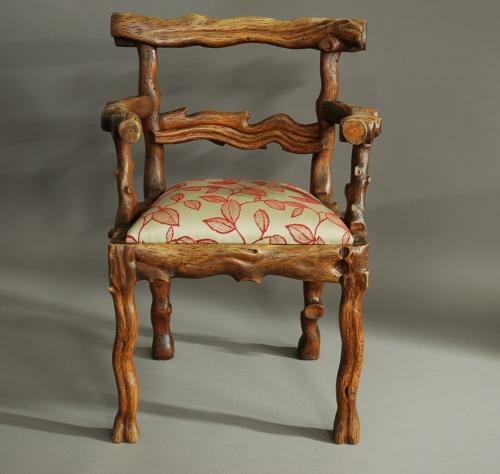 This decorative chair is in the form of branches of a tree with a gnarled wood appearance. This chair has a very unusual design and is well constructed, this shows the skill & expertise of both the cabinet maker & wood carver and was possibly made as a commission or sample piece. The maker has taken influences from natural sources and has created a very unusual and unique piece. Chairs of this type of design are usually from the Black Forest region, however, this chair is English (due to the construction) and therefore makes this an extremely rare item. The recently upholstered 'drop-in' seat has been covered in a leaf design fabric to compliment the chair although this could be easily changed to an alternative fabric once purchased. This chair is superb condition for age, of stable construction and can go straight into a home.